I wrote the other day that Americans, regardless of all the bad policy we get from Washington, should be thankful we’re not stuck in an economic graveyard like Venezuela. But we also should be happy we’re not Europeans. This is a point I’ve made before, usually accompanied by data showing that Americans have significantly higher living standards than their cousins on the other side of the Atlantic. It’s now time to re-emphasize that message. The European Commission has issued its annual report on “Taxation Trends” and it is–at least for wonks and others who care about fiscal policy–a fascinating and compelling document. If you believe in limited government, you’ll read the report in the same way you might look at a deadly traffic accident, filled with morbid curiosity and fear that you may eventually suffer the same fate. But if you’re a statist, you’ll read the report like a 14-year old boy with his first copy of a girlie magazine, filled with fantasies about eventually getting to experience what your eyes are seeing. Let’s start by giving the bureaucrats some credit for self-awareness. They openly admit that the tax burden is very onerous in the European Union. 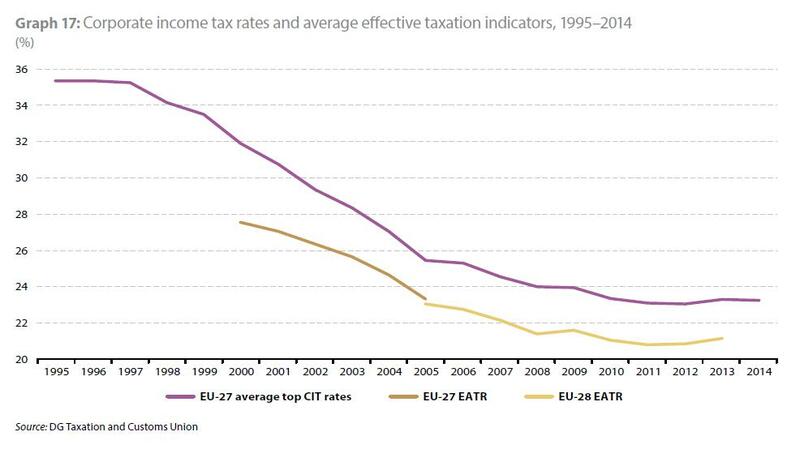 The EU remains a high tax area. In 2012, the overall tax ratio, i.e. the sum of taxes and compulsory actual social contributions in the 28 Member States (EU-28) amounted to 39.4 % in the GDP-weighted average, nearly 15 percentage points of GDP over the level recorded for the USA and around 10 percentage points above the level recorded by Japan. The tax level in the EU is high not only compared to those two countries but also compared to other advanced economies; among the major non-European OECD members for which recent detailed tax data is available, Russia (35.6 % of GDP in 2011) and New Zealand (31.8 % of GDP in 2011) have tax ratios exceeding 30 % of GDP, while tax-to-GDP ratios for Canada, Australia and South Korea (2011 data) remained well below 30 %. Here’s a chart from the report showing that taxes consume about 40 percent of economic output in EU nations. And while Americans correctly view the internal revenue code as very burdensome, taxes “only” consume about 25 percent of GDP in the United States. Other nations with comparatively modest tax burdens include Canada (CA), Australia (AU), South Korea (KR), and Switzerland (CH). But it’s important to understand that not all nations in the European Union are identical. Just as there are high-tax states and low-tax states in America, there are high-tax countries and low-tax countries in Europe. Surprisingly, France was not the worst nation. …the ratio of 2012 tax revenue to GDP was highest in Denmark, Belgium and France (48.1 %, 45.4 % and 45.0 % respectively); the lowest shares were recorded in Lithuania (27.2 % of GDP), Bulgaria (27.9 % of GDP) and Latvia (27.9 % of GDP). I’m surprised, by the way, that Sweden isn’t among the highest-taxed nations. I guess they’ve made even more progress than I thought. Now let’s drill down into the report and look at some of the specific data. You may want to stop reading now if you get easily depressed, because it’s time to look at a chart showing what’s happened to income tax rates. 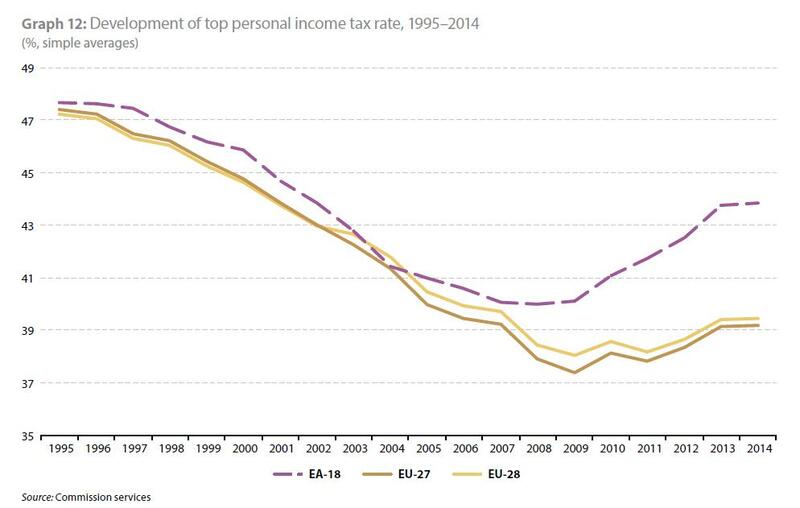 Specifically, this chart shows the average top tax rate on personal income, both for Eurozone (nations using the euro currency) and European Union nations. As you can see, the average top tax rate has jumped by almost four percentage points for euro nations and by about two percentage points for all EU nations. This is very unfortunate. Tax rates were heading in the right direction when there was vigorous tax competition inside Europe. But now that high-tax nations have been somewhat successful in forcing low-tax jurisdictions to become deputy tax enforcers, that positive trend has halted and policy is moving in the wrong direction. But not in all regards. Tax competition also has been compelling governments to lower corporate tax rates. And while that trend has abated, you can see in this chart that politicians haven’t felt they have leeway to push rates higher. Though I am very concerned about the OECD’s campaign to undermine corporate tax competition. If they’re successful, there’s no doubt we’ll see higher corporate tax rates. Let’s now look at some more depressing data. This chart shows that a continuation in the trend toward higher rates for value-added taxes (VATs). I’ve warned repeatedly that the VAT is a money machine for big government and the EU data certainly support my position. But if you want evidence from other parts of the world, there’s some IMF data that clearly shows how politicians use the VAT to expand the burden of government. Last but not least, let’s now draw some conclusions from all this information. At the beginning of the post, I mentioned that Americans should not copy Europe because bigger government translates into lower living standards. Simply stated, there’s a negative relationship between the size of government and economic performance. So let’s look at another piece of data to emphasize that point. The bureaucrats at the OECD just did a report on the U.S. economy and they produced a chart showing that the current recovery is very anemic. 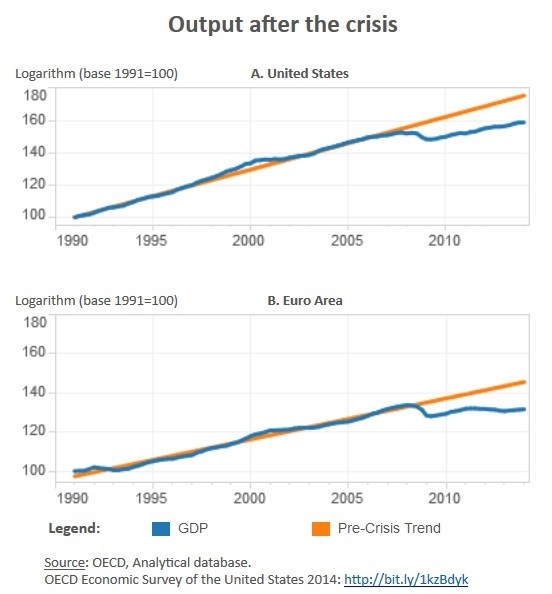 We haven’t recaptured lost economic output, which normally happens after a downturn. Indeed, we haven’t even returned to normal growth levels. But that’s not news to regular readers. I’ve shared powerful data from the Minneapolis Federal Reserve showing the failure of Obamanomics. What is noteworthy, though, is comparing Europe to the United States. As you can see from these two charts, euro nations have flatlined. And if you look at the vertical scale, you can see that they were growing a lot slower than the United States to begin with. In other words, we’re not doing very well in the United States. But compared to Europe, we’re Hong Kong. Two final caveats: First, I always like to stress that economic performance is impacted by a wide range of policies. So while I think that rising tax burdens and higher tax rates are hurting growth in Europe, there are other factors that also matter. Second, any analysis of fiscal policy should also include data on the burden of government spending. After all, a nation with a low tax burden will still suffer economic problems if there’s a large public sector financed by red ink. And one big warning: Obama wants to make America more like Europe. If he succeeds, we can expect European-style stagnation.